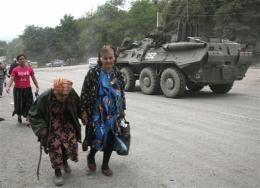 She has been following the conflict on a blog written by a student turned soldier from South Ossetia who was in Tskhinvali sending updates to his blog via his mobile as there was no electricity and the city was destroyed. 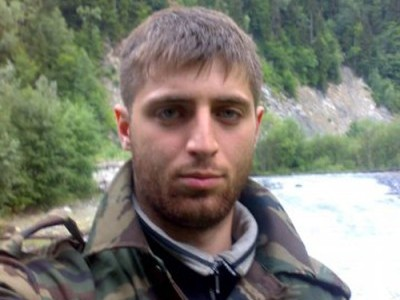 Alan, 26, studies at a university in Moscow and was visiting his parents in Tskhinvali when the fighting started. Later he volunteered to fight and joined Ossetian military forces. Katerina describes his political views as conservative, "seeking no revolutions, but prosperity and peace". However, one has to defend his own country. Today I decided to start my diary. I have never done it before but what I see around is so worrying so I want to share it. It’s been a week when we arrived to Tskhinvali with my friends. On 28 July there was a sunny day promising relaxing holiday. Nothing could tell what would happen in the near future: children were playing in the streets, teens were hanging around, city was as usual and it was like that until 30 July. On 30 July we started receiving worrying news from neighbourhood villages. 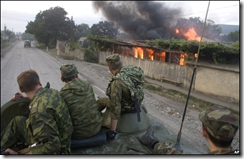 There were rumours that Georgian troops started shooting from large-calibre weapons in some areas of Ossetia and that some people got wounded. Then I heard that on 1 August at 6 p.m. Georgians killed five civilians and one soldier. Night 2 August Georgians started shooting the city from large calibre weapons and trench mortars. As a result I heard that about 10 people were wounded. 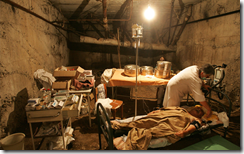 After I with my friends went to morgue and saw three dead bodies – all clad as civilians. There was very heavy atmosphere: blood, women’s cry and stern faces of men full with grief, bewilderment and desire of revenge. The city got empty very quickly: no one can be seen in the streets except soldiers (I think he refers to local Ossetian army – Katerina). Cars were moving with enormous speed, engines revving and grinding sound of caterpillar tracks.of armoured troop carriers. On every corner one can see armed local policemen. All windows of the houses were dark. Street lighting was turned off to make it difficult for Georgian snipers and artillery to aim. Shooting continued until 7 a.m. with short breaks. Morning was hectic: women and children were being evacuated. At the railway station there was a huge crowd of leaving people. Taxi fare to Vladikavkaz rose up to 1000 roubles compared to 350-400 roubles in usual days. One could tell that the situation was serious judging by number of men in camouflage and how cars were driving. Usually if every second man in the city wears uniform and cars driving at high speed ignoring pits on the road this means that the situation is very serious. That morning was exactly like that: many men changed for camouflage and cars were moving very fast. 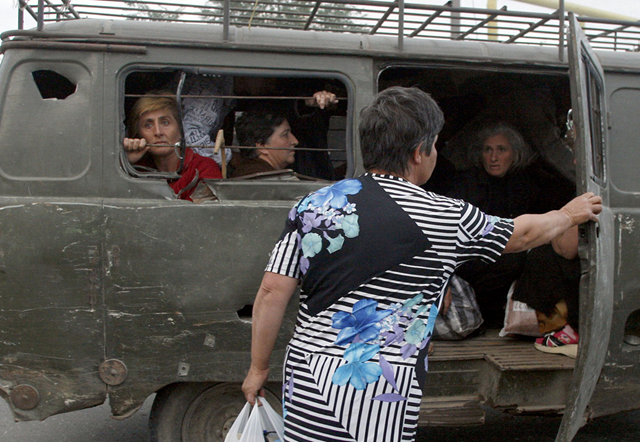 Women and children living in the villages were evacuated. There was an announcement that women and children would be evacuated to North Ossetia where they would wait until the situation calmed down. 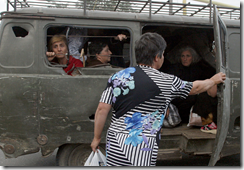 Today about 300 women and children were evacuated to Vladikavkaz. The city looks empty. Theatre square crowded in usual days is empty. Only a police car with a signal indicates that the city is not completely abandoned. On every crossing one can see policemen checking every passing car. Shops are closed or empty. Market was closed yesterday as it is situated at the outskirts of the city. I heard that Georgian troops are getting nearer to the city boundaries, and along the border there are a lot of Georgian snipers. People are irritated, there is already lack of water and food. An hour ago I saw in the sky a signal rocket. My friends were frightened as they thought it was trench mortar shot. People are waiting for Georgian attack. There was announcement about partial mobilization. Few of my friends now did not change into uniform. 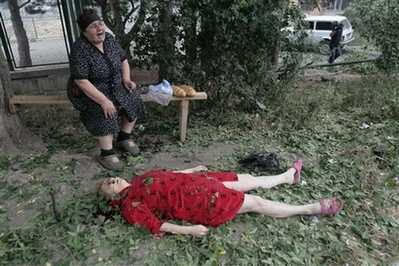 There are rumours that in the villages Georgian snipers disrupt funerals by shooting and hunting people like rabbits. At last I got to the computer. Today was a very difficult day. My friends had to come back and I decided to stay and if necessary to fight. The situation is critical. There is no one in the streets except soldiers and journalists. I can hear trench mortar fire from the direction where Georgian villages are located. I heard there is a shooting in the village Tsunar. There rumours that the war has already started. It is difficult to say what will happen by the morning. Remaining people go hiding in the cellars and do not panic. 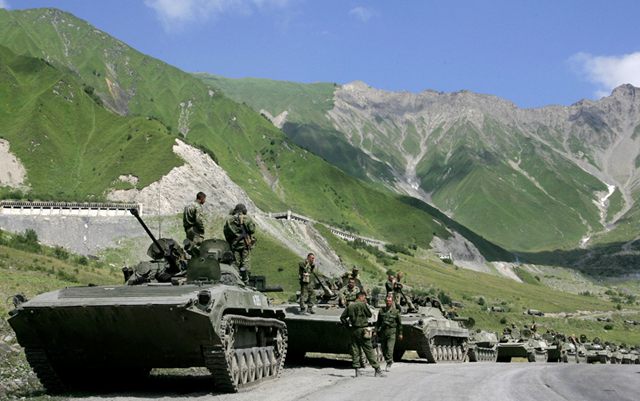 I heard in South Ossetia there are open counterstrikes of Ossetians with Georgian troops. 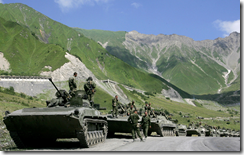 Yesterday I heard the announcement from South Ossetia authorities that two Georgian armoured troop carriers were put out of action. Russian peacemakers did not confirm that but say that yesterday noticed unrecognised jets flying from south to north. As Ossetians do not have own aviation I think they were Georgian. If they were Russian, Georgia would announce that…Probably they did reconnaissance. One still can hear sounds of fighting. Gunfire shots at the outskirts of the city. Trench mortar shooting from the direction of the villages. I do not think it will stop before morning. Georgians must have gone mad!!! Now everything calmed down. Shooting and explosions stopped. 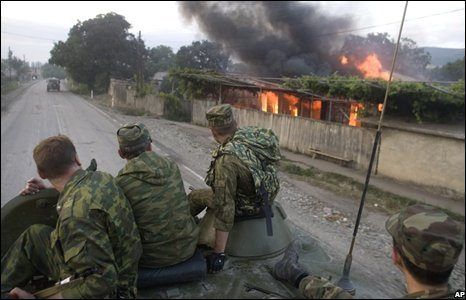 I have just talked on phone to my friend who was mobilized and is now in the village Dmenis. They still have shooting. Many houses are destroyed by Georgians. He told me that there some wounded people but he does not know their names. The city is not sleeping, military jeeps are passing by at high speed. Heavy trench mortar fire! Shooting did not stop all night. People say that Georgians aim at the Ossetian army headquarters. 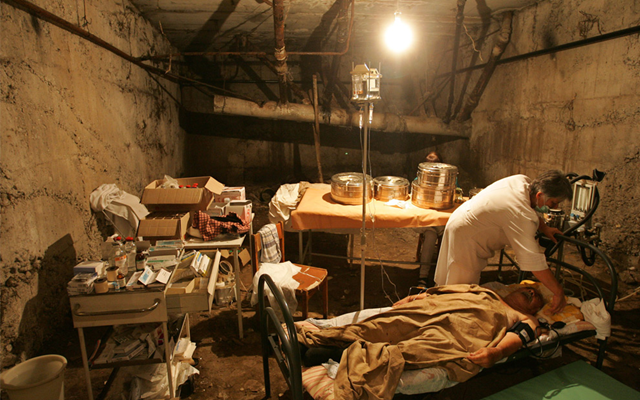 People spent night in the cellars. Was has started!!! I can hear gunfire in the city!!! Closer and closer!!! There were talks that today would be negotiations! Seems no peaceful dialogue will happen anymore! 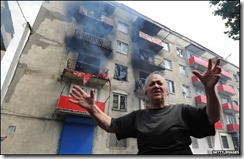 Mamsurov street – gunfire and machinegun fire. I can hear explosions. Very distinctive, so it must be really close. Unceremonious Georgians firing in the city! It’s time for me to go. I can’t write anymore. Later I will tell more about what happened. My neighbour arrived from Tsunar and I want to talk to him. Today I went to bed about 4 a.m. (there is some confusion about time as I showed Greenwich time previously as it is set in my LiveJournal. I did not take into account the time difference – Katerina). In morning my mum waked me up. I was so tired that I did not hear even the grenade explosion very close to my house. We went to the cellar because of the heavy fire and stayed there until 8 a.m. There were about eight different explosions near our house. The house which stood opposite was hit twice. One flat on the fourth floor is fully destroyed. Another flat on the first floor was in a slightly better condition – one room remained intact. 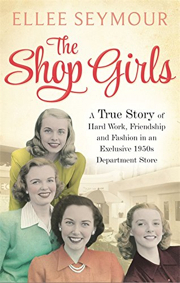 While we were in the cellar our windows and walls got scratched with shell-splinters. In the bedroom all window glass was gone. Luckily all our relatives were not home. In the neighbourhood house one old man was wounded: he happened to be between ground floor and cellar during the explosion. By 9-00 a.m I managed to get to one of the military headquarters as I wanted to volunteer to join the Ossetian military forces. At 10 a.m. shooting stopped. There were about 20 other guys with me willing to be volunteers and fight. We waited until 11-00 when soldiers came back from their positions. The commander told us that he is unable to make any decision right now as he did not sleep three nights and asked to come again by 2 p.m again. There are rumours that Georgians are preparing to storm the Shankhai district in Tskhinvali: there was heavy fighting in this area in the morning. 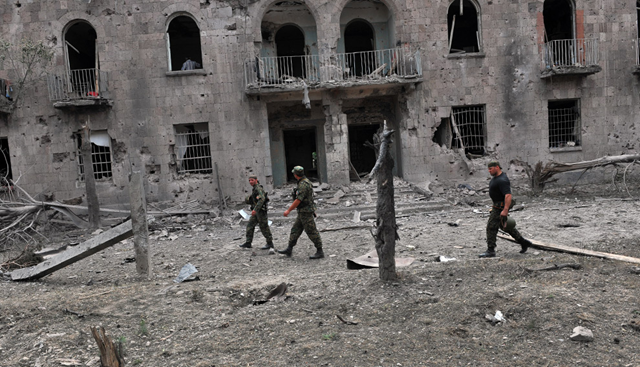 Volunteers from North Ossetia and other parts of the world are arriving to the city. Guys who were defending the city at night say that Georgian did not expect such a strong resistance. Ossets were shooting to the last bullet, almost everyone has run out od ammunition. 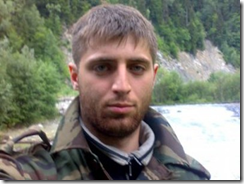 My friend is still on the position at the Shankhai district, Tskhinvali outskirts, he has been there for two days. 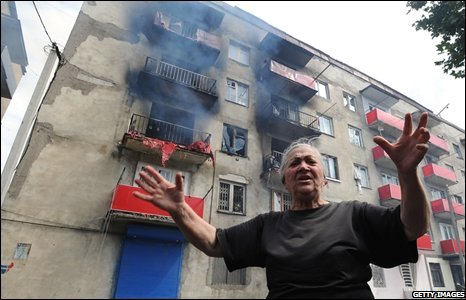 Georgians are cruel: they fire at the houses of the civilians and civilians themselves. It is dangerous to walk on the central streets as you can be killed. 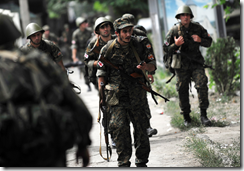 One can see in binoculars that armoured weapons and equipment are being drawn to the southern border of Tskhinvali. In the city all guys are preparing to fight. There is a lack of ammunition for the guns. I could not find the gun for myself but I managed to find some ammunition. Besides war there is a problem with water. It seems that Georgians cut the water communications and water coming into the city reservoirs is not enough for the whole city. Only one city district is provided with water and only in the mornings and in the evenings. But there are water-carriers who deliver water to the population. I have just come back from the city. I spent whole day at the military warehouses. Today I received uniform and a gun. My platoon consists of 14 people and most of them are my friends. Today will be a difficult night: my platoon has to defend its first position. Today is the calm night – thanks to the Russian ambassador Popov (I heard he negotiated stopping the shooting for the night). But everyone is alert as nobody trusts Georgians. During today’s fight in the village Tsunar my friend lost his parents and I am sincerely upset about him. In this village Georgian burned the whole quarter! Many people are now homeless. Georgian tanks and grad rocket launches can be seen from the binoculars on the south outskirts of Tskhinvali. People say, that Georgians decided to send to Ossetia their famous special forces. 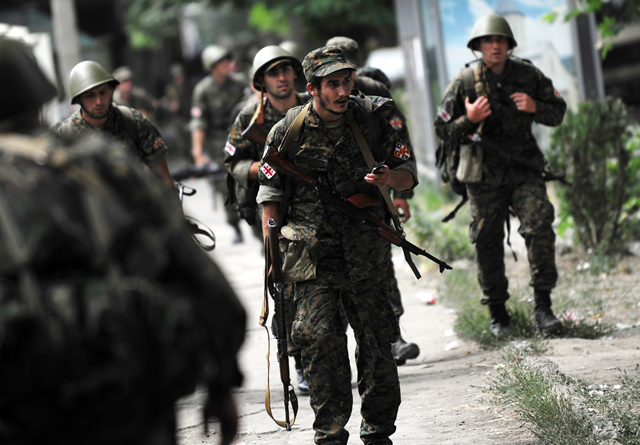 People also say that Georgians lost lots of soldiers and do not want to attack “these crazy Ossetians”. They condemn their leaders but forced to fight with us. Ossetian guys in the city are ready to fight. Everyone is tired of constant tension. People say: It is better to fight once in full and decide this problem that has been lasting for 18 years. *Some of these incredible pictures were taken boston.com, and there are many more too. What really was the point of this war? Despite the end to military operations just announced by Russia against Georgia, were there any winners? Has the "constant tension" been resolved which Alan refers to? Comment deleted due to threatening nature. Oh my god , this is a very heart wrenching story ,The pictures so intense and descriptive. The one with the woman mourning over a dead companion is to striking that it send chills down my spine. I sincerely hope that the war will be over soon, War is always a terrible thing so many lives lost and so many dreams shattered. According to South Ossetia authorities 1492 civilians perished as a result of Georgian storm of the city. Daisy, thank you, and thanks again to Katerina for making it possible. Please update us with the casualty figures, though the true cost of war is much deeper than that. Ellee, the number of casualties is between 1600 and 4000 people and most of them are Ossets. As soon as I get reliable stats I will let you know. Katerina, I wonder how many lives in total have perished. You mention 2,000 in Ossetia, that’s the total population of the village I live in. Hi Katerina, War like this results in so many wasted lives. And yes, let’s hope the conflict is over. Alan is alive. Today he is coming back to Moscow. His family is OK too. They are staying at their relatives. Hopefully this conflict is over. Sadly, there are never any true winners in such a situation. Thank you for posting this viewpoint, Ellee. Thank you Ellie, this is a really interesting post on the situation! An excellent post, Ellee. As it says, there were no winners.